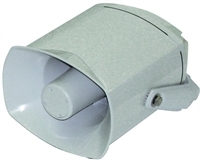 HP-6 This 6W plastic miniature loudspeaker is marine grade IP67 weather proof rated. Suitable for outdoor and indoor installation. This 6W plastic miniature loudspeaker is marine grade IP67 weather proof rated with square front for recessed surface mounting. Suitable for indoor and outdoor installation, especially flush mounted in ceilings and walls. 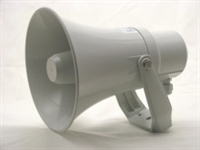 This 8W plastic miniature loudspeaker is marine grade IP 67 weather proof rated. It can be mounted on it's plastic bracket or recess surface mounted via the use of 3 strategically hidden screw holes. 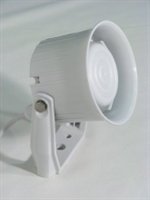 10W plastic IP56 weatherproof loudspeaker. Small and Light. Suitable for outdoor installations, ASA material. Plastic bracket. M-20 glands. 70/100 V transformer with variable power adaption. 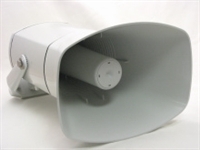 15W plastic IP56 weatherproof loudspeaker. Small and Light. Suitable for outdoor installations, ASA material. Plastic bracket as standard. M-20 glands. 70/100 V transformer with variable power adaption. 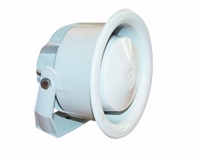 20W plastic IP67 marine grade weatherproof horn speaker. Manufactured for extreme weather conditions and thus very suitable for outdoor use. 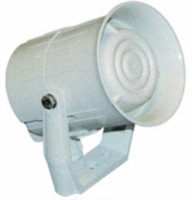 30W plastic IP67 marine grade weatherproof horn speaker. Manufactured for extreme weather conditions and thus very suitable for outdoor use. 15W plastic IP67 marine grade weatherproof horn speaker with and extra large termination chamber allowing for easier installation and reducing the requirements for additional junction boxes. 25W plastic IP67 marine grade weatherproof horn speaker with and extra large termination chamber allowing for easier installation and reducing the requirements for additional junction boxes. 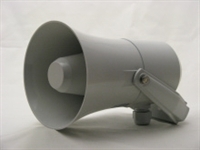 Suitable to cover large areas or in environment that are extremely noisy.